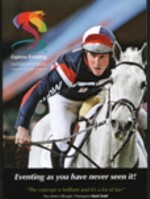 45 riders from 9 nations set out on the 4 days of competition for the eventing medals. The German team filled the first 4 places and had a healthy lead in the team competition after ther dressage. After an influential cross country day there was less than a fence betwen the British, Irish and French teams and during a tense show jumping finale Great Britain held their nerves to secure the gold with Saffi Osbourne and the wonderful mare Little Indian Feather jumping a clear to secure individual gold. Saffi Osbourne's dressage test is shown in full before highlights of the cross country and the showjumping finale concludes the programme. From a forward light seat to the 'oh sh*t' position, Christopher Bartle, coach of the British National Eventing team, wants to improve safety in cross country riding and prove seat positions are the key to success. - How safe seat positions can help you to ride successfully through the cross country course. - Which 5 cross country seat positions should be known by every cross country rider. - How you can sit in balance with your horse both before and after the jump. - Which are the most common seat errors and how you can avoid them. - How the 'oh sh*t' position can rescue you and your horse from difficult situations. A must see for beginners, advanced riders and professionals. The Mitsubishi Motors Badminton Horse Trials 2017 was undoubtedly one of the greats! With a stellar field of international riders including a number of previous winners, this was surely a Badminton to go down in the history books as Andrew Nicholson finally won the title he so richly deserved being his 37th completion! This years DVD features a 52 minute highlights programme with commentary by Lizzie Greenwood-Hughes and Mike Tucker. Extras include the top 3 dressage tests and cross country rounds from Ingrid Klimke, Michael Jung and Andrew Nicholson in full. 77 Combinations took part in the 2016 Badminton Horse Trials, which was celebrating 25 years sponsorship with Mitsubishi Motors. Clear favourite, Michael Jung riding his amazing horse La Biosthetique Sam, was going for the $350,000 Rolex Grand Slam as well as the £80,000 first prize. They never had a moments worry as they outclassed their 76 rivals to post a record winning score, leading from start to finish. This year's DVD features a 20 mins course walk with Lizzie Greenwood Hughes and Harry Meade, followed by a 52 min highlights programme. In additional Michael Jung and Emily King's full dresssage tests are separate chapters. 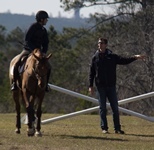 Eventing star William Fox-Pitt gave a clinic at Stable View in South Carolina, USA, in February 2015. This well produced programme covers flatwork, jumping and cross country and is full of useful tips and training information. This was the first time Scotland had hosted an international equestrian event and the beautiful setting at Blair Castle in Perthshire was the spectacular venue. The Germans were the odds on favourites going into the event and they proved why they are the World's No 1 country in eventing with a comprehensive all the way win in the team competition led by their superstar Michael Jung. Great Britain were a distant second for silver with France taking the bronze. Michael Jung, riding the youngest horse in the competition, the 8 yr old Fischer Takinou, was one of only 3 clears over Ian Stark's attractive cross country course to be inside the optimum time, a target that became increasingly difficult to achieve as relentless rain on the Saturday heavily favoured the early starters. Jung's usual polished clear round in the showjumping on the Sunday confirmed his superiority over fellow team mate and World Champion Sandra Auffarth with France's Thibaut Vallette grabbing bronze after Issy Taylor (GB) had one down showjumping on Briarlands Matilda. This year's event saw 57 of the 81 combinations that set out on the 4 days of competition complete the Sunday afternoon as William Fox-Pitt secured his second Mitsubishi Motors Badminton trophy on Chris Stone's stallion Chilli Morning, 11 years after winning on Tamarillo. The first 5 after dressage remainined in that order after cross country, with 14 combinations jumping clear inside the time. One fence down separated the top 5 on the final day as Andrew Nicholson and Nereo tried to hold the others at bay at the top of the leader board but yet again this most coveted of trophies eluded the NZ maestro as Nereo posted 12 penalities on the show jumping to drop to 6th. The best of the dressage is followed by the course walk with some top riders, then extensive highlights of the cross country and finally the concluding action in the show jumping arena. The Team competition always looked to be Germany's to take on paper but when reigning individual Champion Michael Jung could only ride his 3rd string horse, the lovely mare Fischerrocana, the other Nations must have hoped the Champion might not be as powerful and had left the door slightly ajar after cross country. However, immaculate performances in the final show jumping by the Germans confirmed their World No 1 team status and also resulted in Sandra Auffarth pipping team mate Michael Jung for the individual Gold Medal. Britain's William Fox-Pitt led the British challenge on the stallion Chilli Morning and was the overnight leader after cross country but could not jump the necessary clear to win his first World title although held onto bronze. Eighty three combinations from fourteen Nations contested the 2014 running of the Mitsubishi Motors Badminton Horse Trials with five previous winners in the line-up. The main talking point was new course designer Giseppe Della Chiesa's cross country test which had "big" written all over it. Most riders and pundits were very complimentary after walking it as innovation had been well balanced with tradition to provide a very imposing but fair test. However after overnight rain two jumping efforts were taken out leaving thirty numbered fences and forty one jumping efforts but few could have foreseen how influencial the cross country would be on the final outcome as wind rain and testing underfoot conditions all played their part in adding to the fearsome jumping test . Comprehensive cross country coverage is sandwiched between the best of the dressage and an extraordinary showjumping finale that made this a Badminton that will be talked about for many years to come. With 3rd placed Harry Meade in the expert commentator's chair this 2 hour programme is a comprehensive review of this thrilling event and a must for all eventing enthusiasts. This year's big question centred on how 67 partnerships from 11 countries would manage the newly designed 'Start and Finish' of Captain Mark Phillips' cross country test: in particular the intensity of the first five minutes. In the dressage phase it was Jonathan 'Jock' Paget and Clifton Promise who set the pace, with Ingrid Klimke with FRH Butts Abraxxas on their Burghley debut attracting less than 40 penalty points. William Fox-Pitt in fourth place, led the British challenge on his 2011 Burghley Champion Parkland Hawk. The final day brought early disappointment for Jonathan Paget having to withdraw but with one showjumping fence in hand over both Andrew Nicholson and William Fox-Pitt, the overnight leaders still had the chance to emulate Ginny Leng and Master Craftsman, the last horse and rider partnership 24 years earlier in 1989 to win both Badminton and Burghley in the same season. Presented by Clare Balding. Approx. 131 mins. 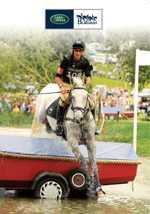 Eventing, or Horse Trials as it is also known, is the ultimate equestrian test. Its foundations were in the Cavalry schools of Europe at the turn of the nineteenth and twentieth centuries. Initially it was only open to male officers, but soon developed into an Olympic sport where men and women compete on equal terms. The format has evolved over the years, but the sport tests the skills of Dressage (effectively basic training), Cross Country, over a course of solid obstacles and hazards such as ditches and lakes and Jumping, over knock down, coloured poles. The top competitions are Three Day Events and include such well known sporting spectaculars as Badminton and Burghley, where crowds can reach up to 120,000. Many of the venues, especially in Great Britain, are in beautiful stately parks. 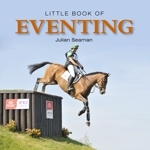 Little Book of Eventing reveals the history, introduces the reader to some of the great stars  human and equine  over the years, the charismatic trainers and some of the best known venues. It also shows what goes on behind the scenes and offers tips on how to take part at novice level or become involved on the organisation side. Burghley Horse Trials has been a perennial delight for both riders and spectators ever since the Marquess of Exeter started it in his beautiful parkland in 1961. 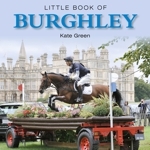 The Little Book of Burghley charts the events rapid elevation to the status of much-loved sporting institution through the riders, horses and officials who made their mark at Burghley. 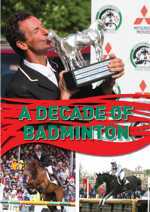 It also provides a fascinating snapshot into how the sport of eventing has modernised during 60 years of triumph and drama and how Burghley has played an important part in that development. Above all, it shows why Burghley Horse Trials has become the ultimate annual highlight in any sportsmans calendar. The 2013 Mitsubishi Motors Badminton Horse Trials was the most eagerly awaited in recent times, with both Andrew Nicholson and William Fox-Pitt qualified to win the Rolex Grand Slam if they triumphed at this year's event on either of their two horses, plus the presence of Olympic, World and European Gold medallist Michael Jung with the amazing La Biosthetique Sam. But the title would go to the triumphant young New Zealander, Jock Paget. Extensive coverage of the cross country is sandwiched between the best of the dressage and the last rounds of the showjumping. Commentary by Jamie Hawksfield and Mike Tucker. Approx. 120 mins. An MBPtv Production for Equestrian Vision. 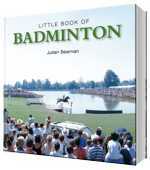 The Little Book of Badminton by Julian Seaman is available NOW. "Badminton Horse Trials" is the world famous annual sporting event that tests the skills of the ultimate horse and rider. 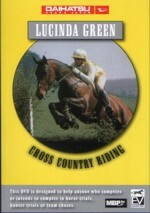 It consists of Dressage, Cross Country and Show Jumping. With a crowd of up to 150,000 over the long weekend of competition, the Event, started in 1949, has produced stars such as Lucinda Prior-Palmer, Mark Todd, Mary King and Pippa Funnell. Princess Anne, Mark Phillips and their daughter, Zara, have also all competed at Badminton. The Little Book of Badminton tells the story of this fantastic outdoor, family friendly, yearly outing, held in a beautiful park with the classic backdrop of Badminton House. 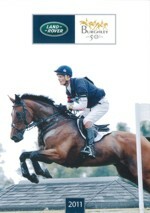 SALE PRICE, was £16.99, NOW £10.99 The Land Rover Burghley Horse Trials 2012 review DVD. 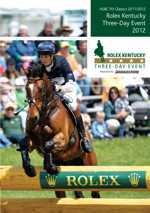 57 combinations set out to win this years first 4 star event at the Kentucky Horse Park and as usual there was a strong overseas entry headed by the Land Rover Burghley 2011 winner William Fox-Pitt and Catherine Witts 12 yr ex New Zealand racehorse Parklane Hawk. USAs Allison Springer led the way after dressage being the only competitor to break the 40 penalty barrier but Fox-Pitt was well in touch and Derek Di Grazias cross country course brought out the very best in the British ace as he and Parklane Hawk flew round without penalty. A few time faults dropped Alison Springer below Fox -Pitt and thats how it stayed after the showjumping as each of the first two lowered one pole. This was Fox  Pitts third major win in a row following Burghley and Pau in 2011 and the second leg of the Rolex Grand Slam. 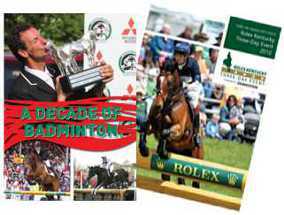 However, with the cancellation of the Mitsubishi Motors Badminton Horse Trials he will have to wait until Badminton 2013 to see if he can pick up the $250,000 prize on offer from Rolex. Approx 52mins duration. With the cancellation of the Mitsubishi Motors Badminton Horse Trials 2012, director and course designer Hugh Thomas, international event rider William Fox-Pitt and BBC commentator Mike Tucker talk about the reasons behind this decision as well as the impact it had. We then move on to journey through the last decade of an event, reliving the great winning performances as well as the changes that have evolved. Badminton is a destination that is pivotal to the eventing calendar, a place where dreams are either shattered or realised. Approx 52 mins. From the black and white footage of early events to the latest coverage of the 60th year of Badminton, this historical programme charts the history in film of the world's premier 3 Day Event. 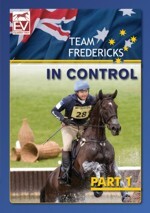 Australian Olympic duo Clayton and Lucinda Fredericks welcome you into their world of Eventing. 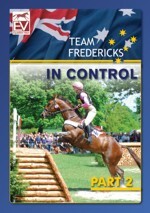 Between them they have won all the major titles and the In Control double DVD series will share with you their training philosophy, tips and tricks and give you a personal insight into the day to day running of a top class eventing yard. 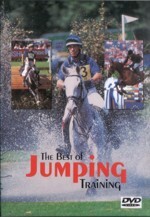 A must have training DVD for every eventers collection. As seen on Horse & Country TV. 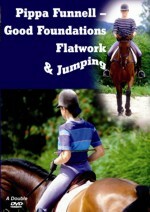 Part 1 includes Types of Horse, German Masters, Schooling, Stride, Straightness and Overcoming Jumping Problems. 2 hrs 15 mins. duration. Part 2  includes Young Riders, Dressage Warm Up, Show Jumping Warm Up, Cross Country at Home, Cross Country for Real and Stuttgart Clinic. 2 hrs 15 mins. duration. As seen on Horse & Country TV - Australian Olympic duo Clayton and Lucinda Fredericks welcome you into their world of Eventing. 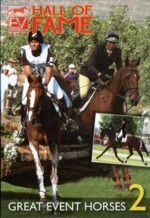 Double DVD set - A must have training DVD for every eventers collection. SALE PRICE, was £16.99, NOW £10.99 Celebrating its 50th Anniversary the centre piece of this years Autumn Classic of Eventing was undoubtedly the retro styled Cross Country track designed by Captain Mark Phillips with the spectacular new lake crossing at its heart . Ingrid Klimke, the Olympic and World Champion is the only professional rider in the world who rides successfully at international level in both dressage and eventing. 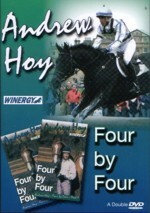 In Volume 1 of this 3 volume series, Ingrid introduces her multi-disciplinary approach, using exercises in the four areas of dressage, pole work, jumping and cross country to produce a versatile, confident young 4 year old. Ingrid Klimke, the Olympic and World Champion is the only professional rider in the world who rides successfully at international level in both dressage and eventing. 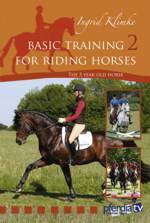 In Volume 2 of this 3 volume series, Ingrid shows exercises in all four areas of dressage, pole work, jumping and cross country to further develop the skills of the 5 year old horse. Ingrid Klimke, the Olympic and World Champion is the only professional rider in the world who rides successfully at international level in both dressage and eventing. 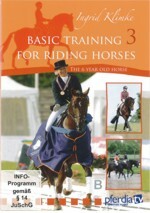 In Volume 3 of this 3 volume series, Ingrid shows further exercises in all four areas of dressage, pole work, jumping and cross country to hone the skills of the 6 year old competition horse. In blustery conditions, the 49th Burghley Horse Trials attracted 80 of the world's best horses and riders, representing 12 nations from Europe, New Zealand, Australia, Brazil and North America. After the opening dressage phase, Oliver Townend on Carousel Quest led the way but with just 12 penalties separating the top 25, the competition was wide open as 77 contenders prepared for the crucial cross country phase. Despite incurring 3.2 time penalties, he narrowly retained the lead but with just one show jumping fence in hand over Australia's Sam Griffiths on Happy Times and two in hand over New Zealand's Caroline Powell on Lenamore and America's Phillip Dutton on Truluck. Presented by Clare Balding, this DVD is approx 98 mins. 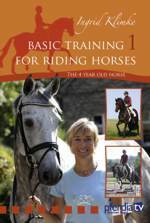 The chapters in this training programme cover the following areas: Getting Ready - Horse and Rider, Warming Up, The First Fence, Ditch and Rail, On the Turn, Jumping Up and Down and Water. 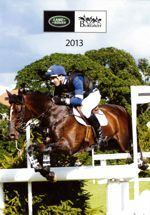 A number of different fences and combinations are jumped and this DVD is relevant to anyone wishing to ride across country, whether it is at an event or out on the hunting field. Approx 67 mins. In this two part series Andrew explains and demonstrates with the help of others, the simplicity of his 'Four by Four' approach that has helped take him to the top of the sport of eventing. Approx. 60 mins each. DVD. The inaugural running of the Express Eventing International Cup saw 19 of the world's top event riders vying for a top prize of £100,000 in the imposing Millennium Stadium in Cardiff. This was the first time event riders have had to ride their dressage tests to music and it was a great spectacle. "Working for the music test helped our dressage massively" said second placed Lucy Wiegersma. The show jumping and cross country phases saw lots of thrills and spills, with many riders failing to complete the 3 phases but Oliver Townend and his imposing grey Flint Curtis stormed round the stadium in spectacular fashion to a convincing victory. "The concept is brilliant and it's a lot of fun," said 2 times Olympic Champion Mark Todd. Presented By Alice Plunkett and approx 90 mins. 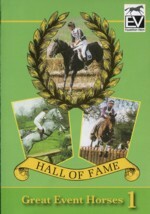 Stars of the late 20th Century including Mark Todd, Lucinda Green, Ginny Leng, Ian Stark, Blyth Tait and Bruce Davidson to name a few, are captured in action on this wonderful historical programme, along with the equine stars of that time such as Priceless, King William, Charisma, Sir Barnaby and many more. Approx 50 mins. 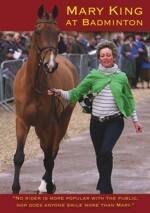 A camera crew follows Mary King in 2007 and 2008 as she competes at the Mitsubishi Motors Badminton Horse Trials. This is the story of her triumphs and disasters and includes unique behind the scenes footage. EV production. Approx. 47 mins duration. 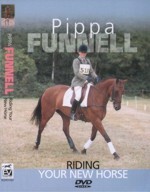 Pippa Funnell - Good Foundations. Flatwork & Jumping. Double DVD. Disc 1 - Approx. 95 mins. Disc 2 - Approx.58 mins. One of the great strengths of the double European and Badminton Champion is her ability to forge successful partnerships with her new horses and she cannot stress strongly enough the importance of developing that unique relationship. Approx 90 mins. DVD. 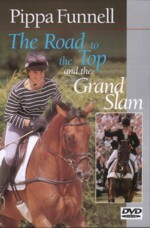 Pippa Funnell Road to the Top & the Grand Slam. DVD. 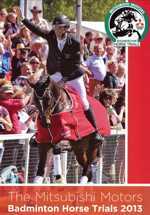 Equestrian Vision have produced and distributed a number of training programmes featuring many of the top riders, such as Mark Todd, Lucinda Green, Nelson Pessoa and David O'Connor to name a few. In this programme we have picked out some of the best advice from nine different videos starting with the rider's position and ending with jumping a water complex across country. The Mark Todd Collection of three DVDs. Disc 1: The Young Horse - General flatwork and preparing for dressage. Disc 2: Preparing for show jumping and cross country training at home. Disc 3: 20 years of cross country. Notable rounds of Marks illustrious career. Copyright © 2013 Equestrian Vision All rights reserved.